It isn’t every day that 75 dollars can save a baby whale shark, but that’s what happened on the shore of Ambon Island, Indonesia recently. A group of local fishermen were in the process of pulling the young creature up to land when a Russian scuba diver noticed their catch and decided to intervene. 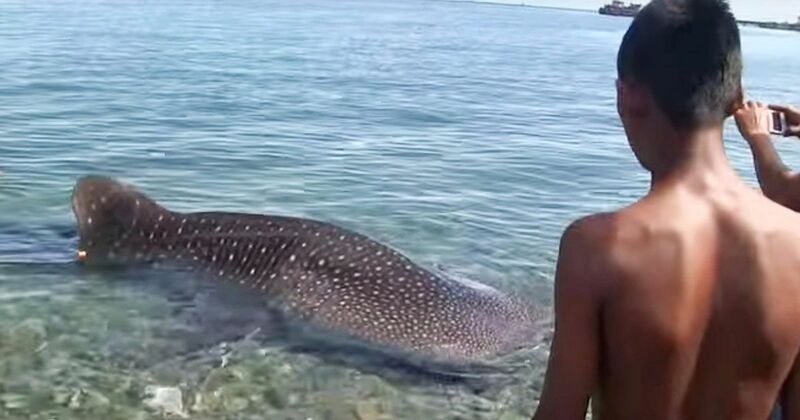 While young boys climbed on the struggling Whale shark’s back and took tasteless photos, this savior of the whales negotiated for the animal’s life. Finally, a price was agreed upon. For 75 dollars, the Whale shark was freed and sent back to sea. A Whale shark isn’t technically a whale, it is a shark. They’re called Whale sharks because their demeanor and size are more akin to a small whale than most sharks. They are gentle; they are filter feeding, and they are the largest known fish in the sea. They often measure 40 feet long. The fishermen in this video aren’t the first to rejoice at a Whale shark catch. The creature’s fins and meat command a pretty penny on the market. For fishermen without market access, it’s still a whole lot of fish to sell. Fishermen in Indonesia are often impoverished labor. Their earnings are small and fluctuate widely depending on the number of fish available. It’s no wonder they’re happy to catch whatever is available, but it is shortsighted. As fish populations worldwide continue to decline, the situation for fishermen only gets worse. Whale shark catches are fewer and the whales themselves smaller than they were ten years ago. This has led many to report that the species is in trouble and needs our protection. Every little bit counts and men like our Russian scuba diver are heroes to these vulnerable animals.